BRUSSELS (Reuters) - Twenty-five years after the fall of the Berlin Wall reunited Europe, the European Union hailed a "historic turning point" in the Caribbean with the renewal of diplomatic relations between Cuba and the United States. "Today another Wall has started to fall," EU foreign policy chief Federica Mogherini said in a statement. "These moves represent a victory of dialogue over confrontation." European governments, while critical of Cuban human rights abuses, have long urged Washington to follow them in improving relations with the communist-ruled island, especially since the end of the Cold War and the collapse of Cuba's Soviet sponsor. Mogherini said the EU, which lifted diplomatic sanctions on Cuba in 2008, favored dialogue. In April, it began negotiations on a cooperation agreement, although Cuba recently put off talks that were due to have discussed human rights. 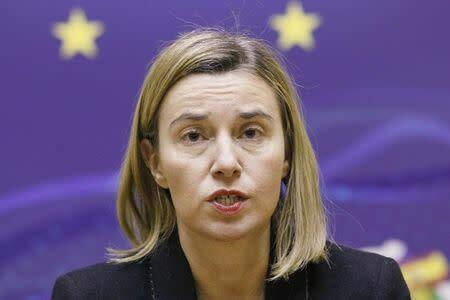 "Human rights remain at the heart of EU policy towards Cuba," said Mogherini, a former Italian foreign minister. She also thanked Pope Francis for his "wisdom" in helping to mediate between Havana and Washington.